Do you ever feel so desperate and helpless where the only words that come to mind are "Lord, help! "—when you know there's nothing you can do on your own strength? 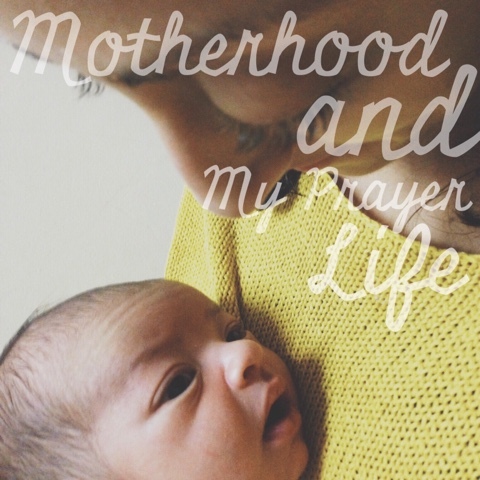 Motherhood often brings me to the most humbling position—on my knees. (I say that only figuratively. I mean, let's be honest, I'm usually sitting on the sofa breastfeeding.) Life is new, life is different, life is exciting! A new baby brings in many new joys but also many new challenges. I've realized, now more than ever, that I am terrible at balancing my time, that I have no clue what I should prioritize, and that I often end up neglecting my own needs so I can coddle my baby. I don't want to spoil him, but I'm not exactly motivated to bathe when my baby is screaming from teething pain and just wanting to be held. There goes my shower, there goes my chance to eat, and there goes any hopes of making my house look liveable (at the very least). I've also realized how much of a Martha I am. How I'm always on the go and can't seem to just sit still and hear from the Lord. God, please change that character flaw of mine. I feel like God keeps nudging me to make the most of my [very frequent] times of breastfeeding. Those times where I can't really do much else, I could spend reading His word or praying. But let's be real; when do I actually spend that time reading His word or even talking to Him? Often, that time is wasted. I browse social media on my phone for a bit, lose interest, and then proceed to playing games. Not that anything is wrong with those things in and of themselves, but they definitely aren't uplifting. And that's when I usually cry out to the Lord out of desperation. I hate feeling a lack in my spiritual life. I hate feeling that all the neglecting of my own needs has been done in vain and my baby is still overtired, hungry, and teething. Lord, help! Take me out of this dry place. Lord, help! I don't know what I'm doing as a mother. Lord, help! Multiply my time so I can bathe, eat, cook, and clean! Lord, help! Keep household duties from being such a burden so I can spend quality time with my husband when he is home. Lord, help! Cause me to cherish this season of life and not miss the special moments You bless me with every day. And thank You, Lord, for using my baby to remind me to come to You. This entry was posted on Jun 3, 2015 and is filed under Faith , Motherhood , Parenthood . You can follow any responses to this entry through the RSS 2.0 . You can leave a response . How beautiful...and encouraging! You are doing great. Grace and peace to you.